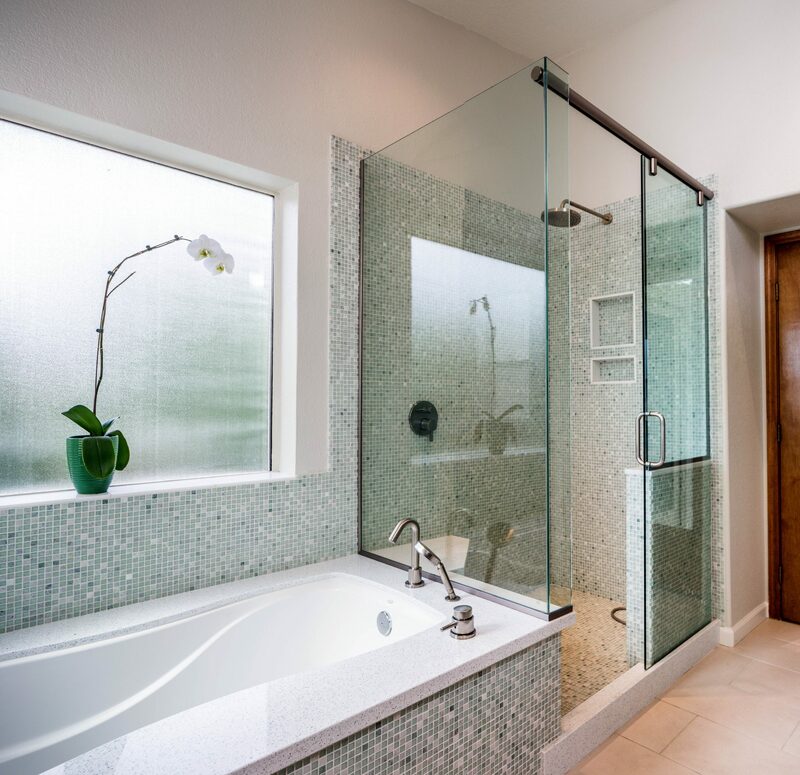 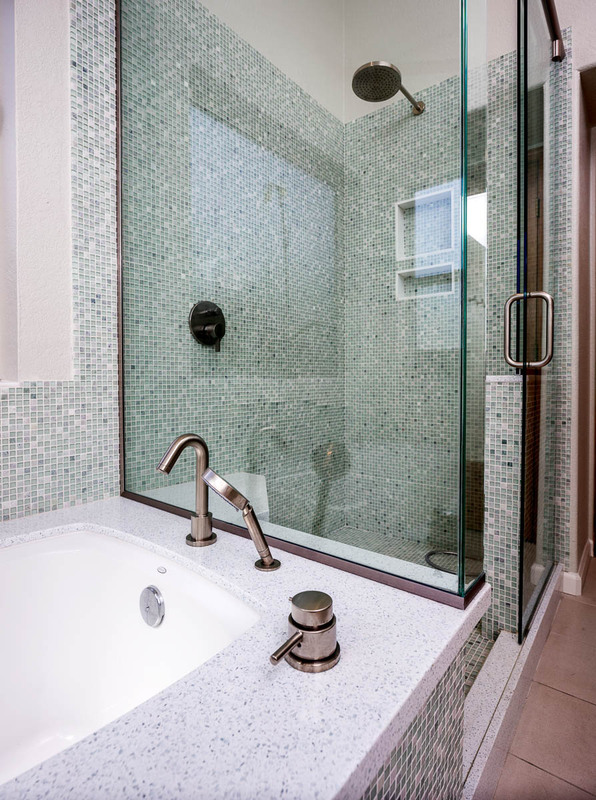 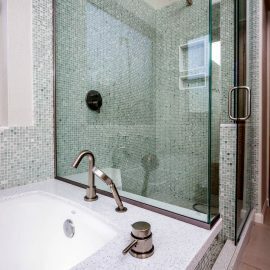 Chandler Spa Suite – Studio Em Interiors -Small mosaic tiles in calming shades of blue and green were used around the tub and shower area. 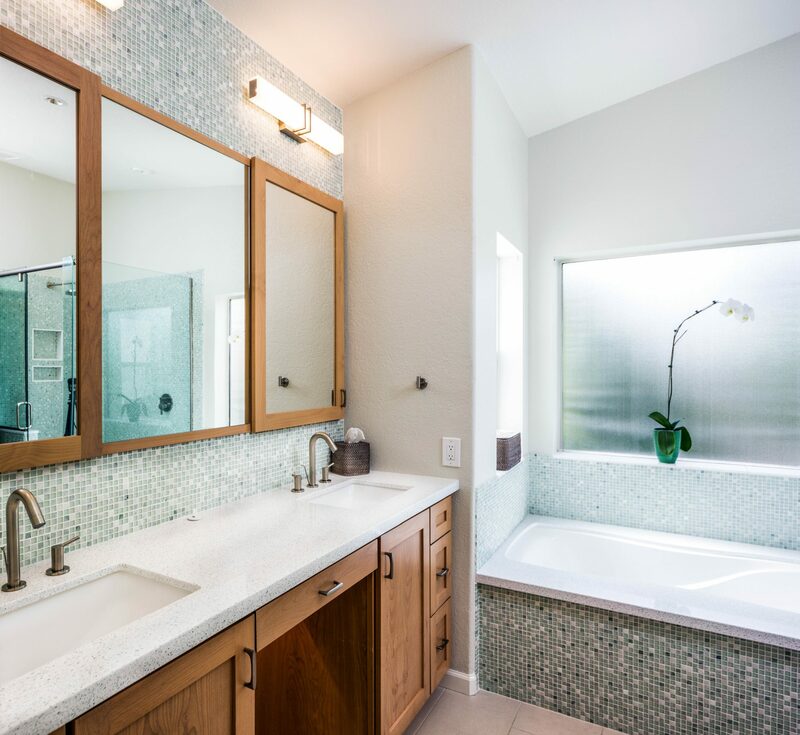 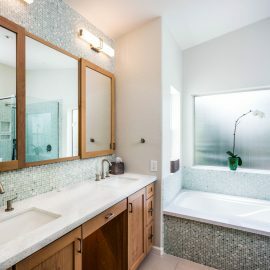 Chandler Spa Suite – Studio Em Interiors – The countertops have pieces of recycled glass inlaid in the tops, using the blue and green tones throughout. 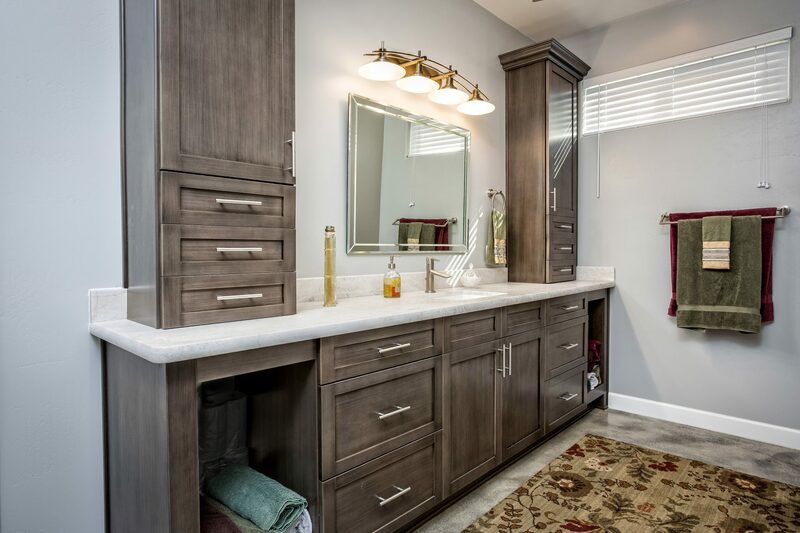 Chandler Spa Suite – Studio Em Interiors -The lighter wood cabinetry at the vanity helps to keep a bright, airy feeling in the space. 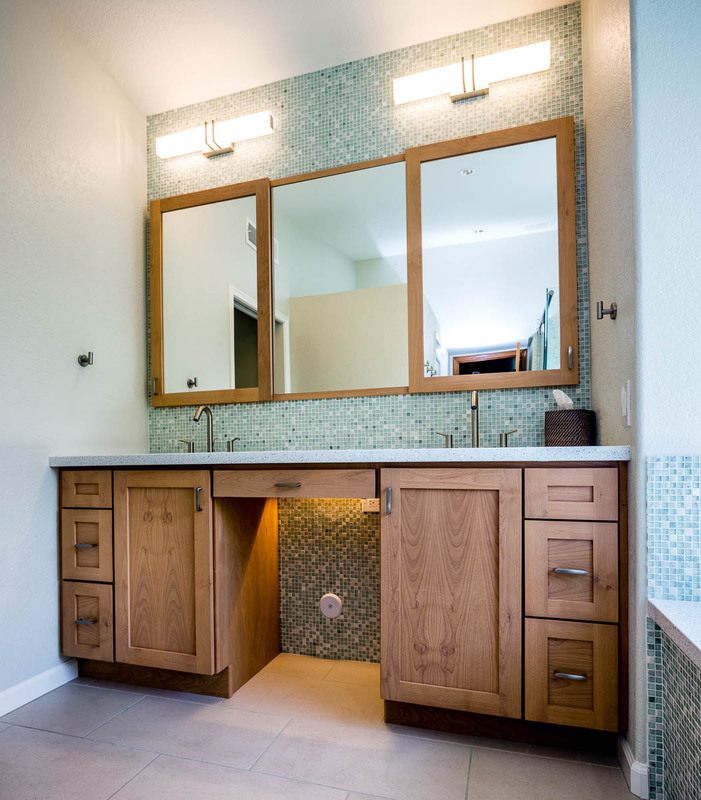 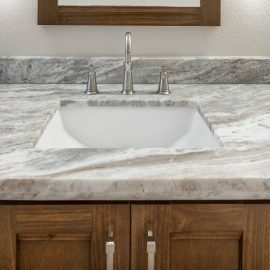 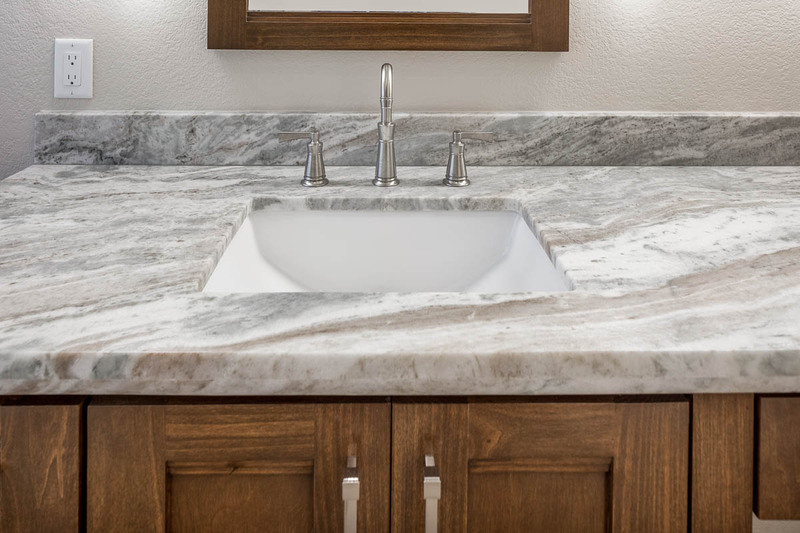 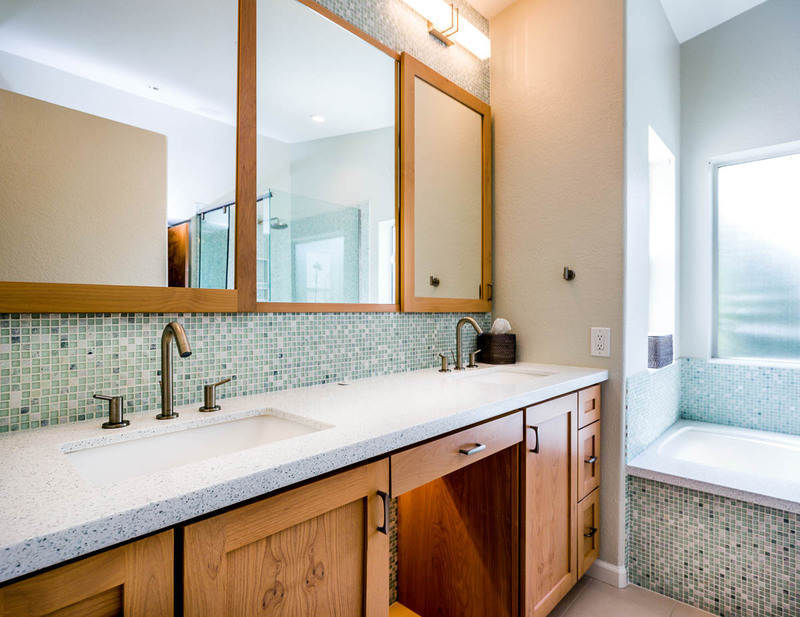 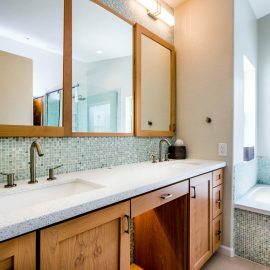 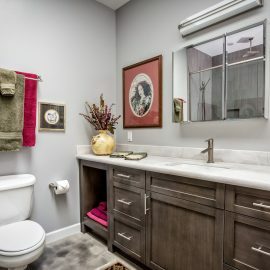 The mirror has a medicine cabinet above each sink. 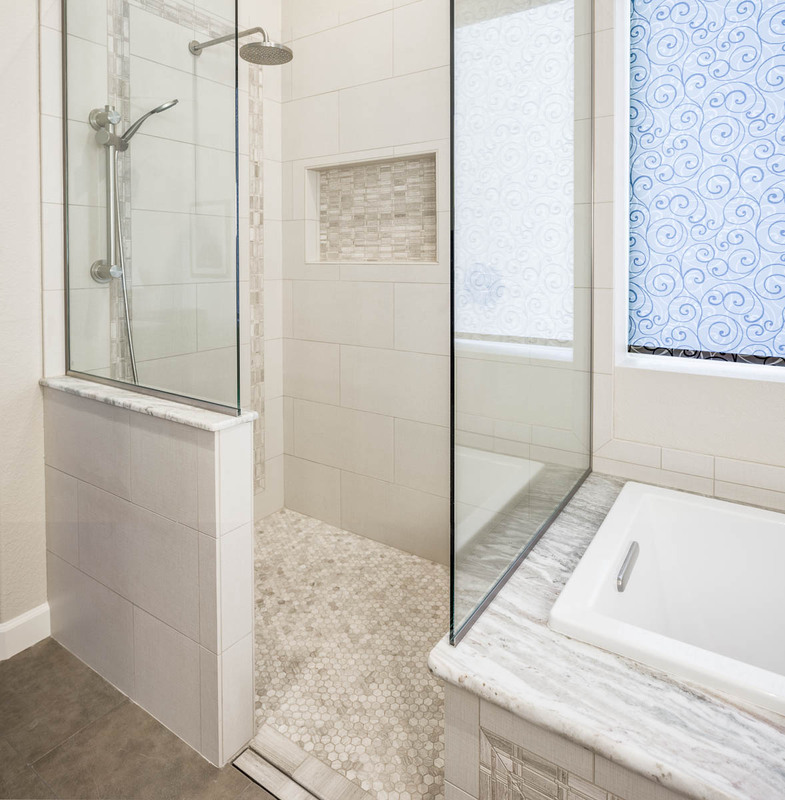 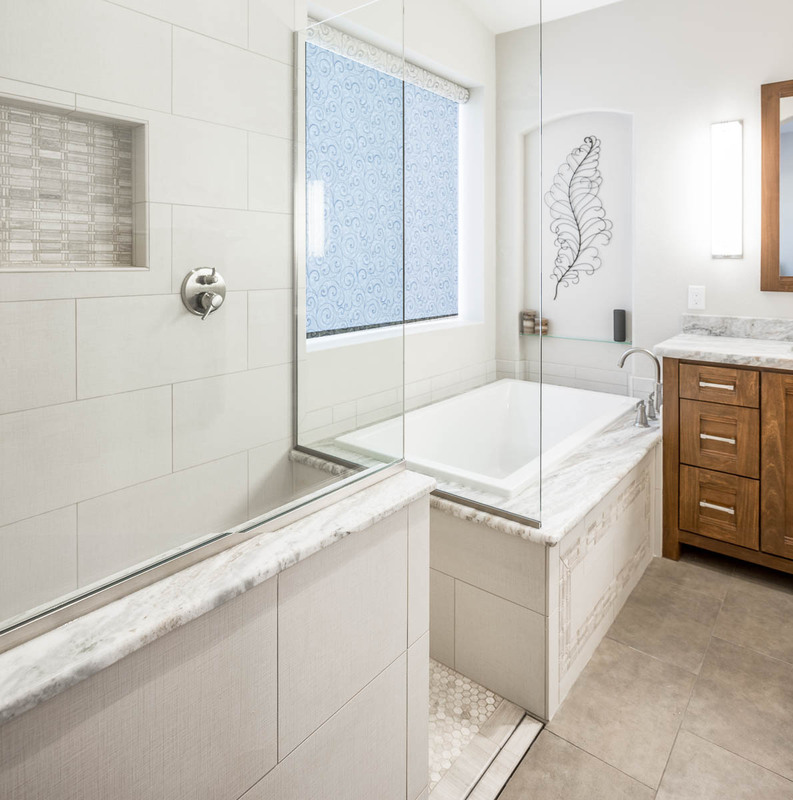 Chandler Spa Suite – Studio Em Interiors – To add to the luxurious, spa like feel of the space we added the same mosaic tiles used in the tub/shower area behind the vanity area. 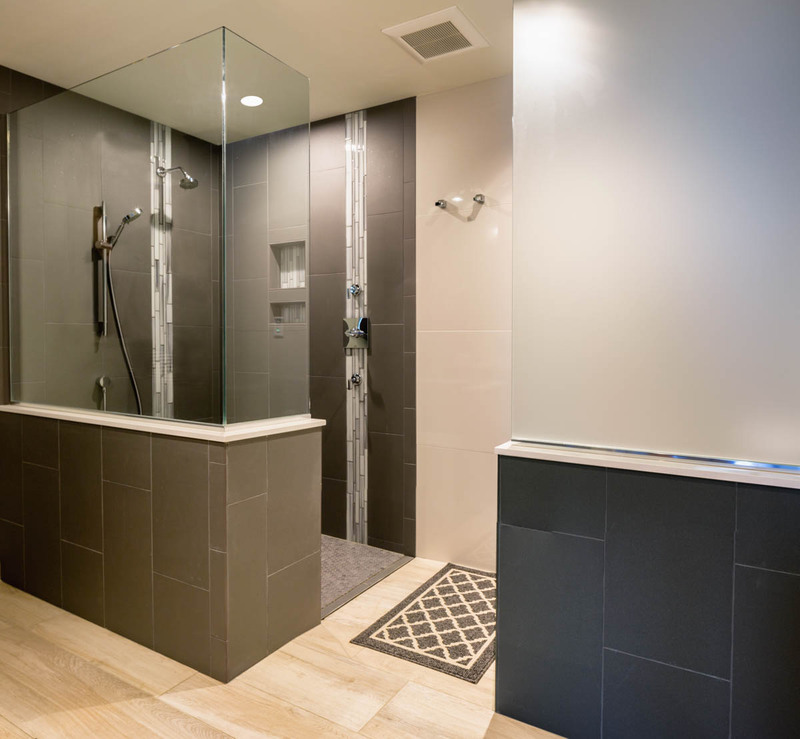 By adding a little extra detail, a huge impact was created adding to the spa like feel. 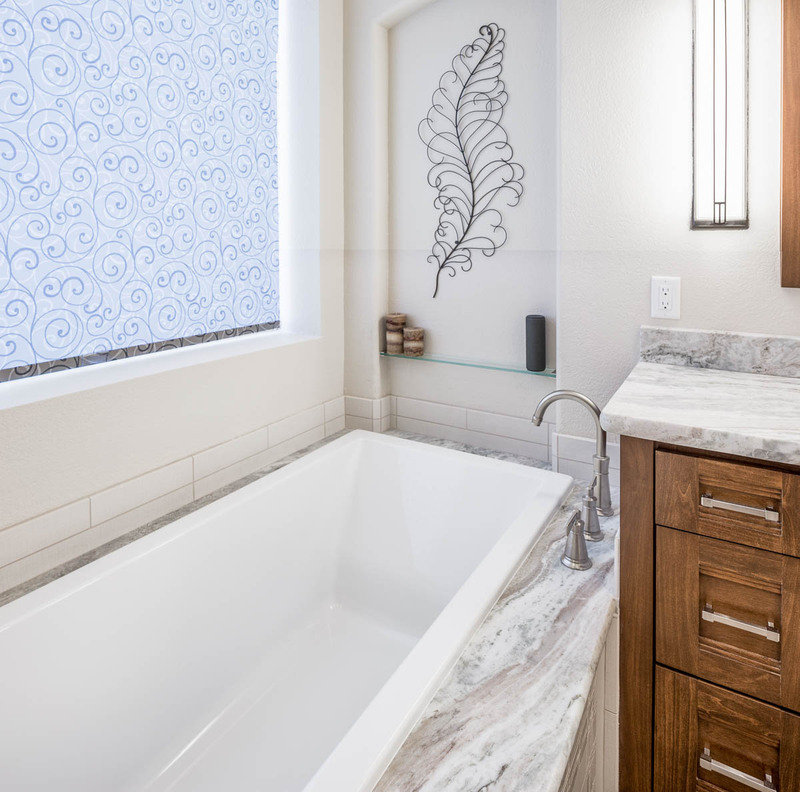 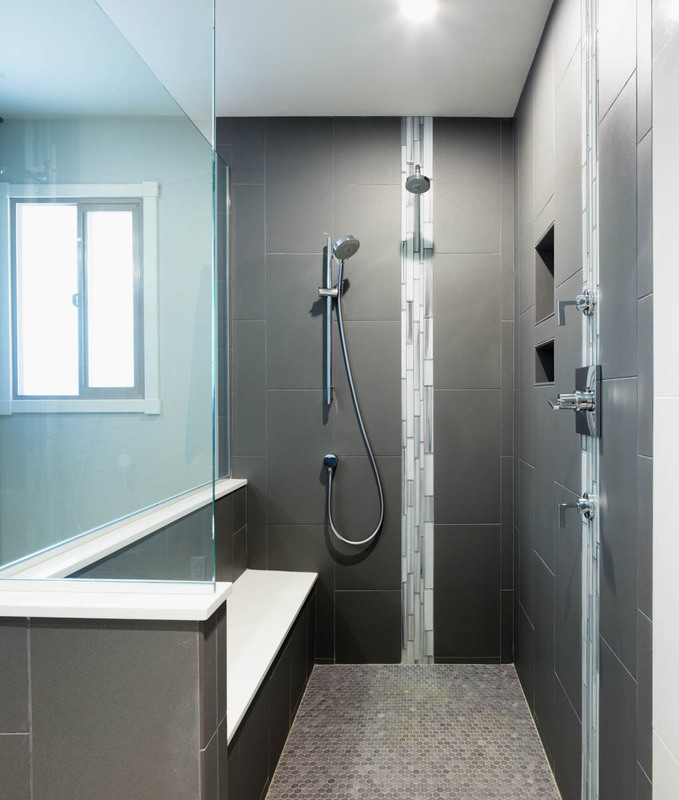 Chandler Spa Suite – Studio Em Interiors – Simple, modern fixtures were used throughout to keep a clean feel to the entire space. 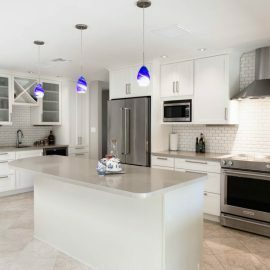 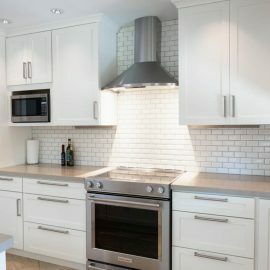 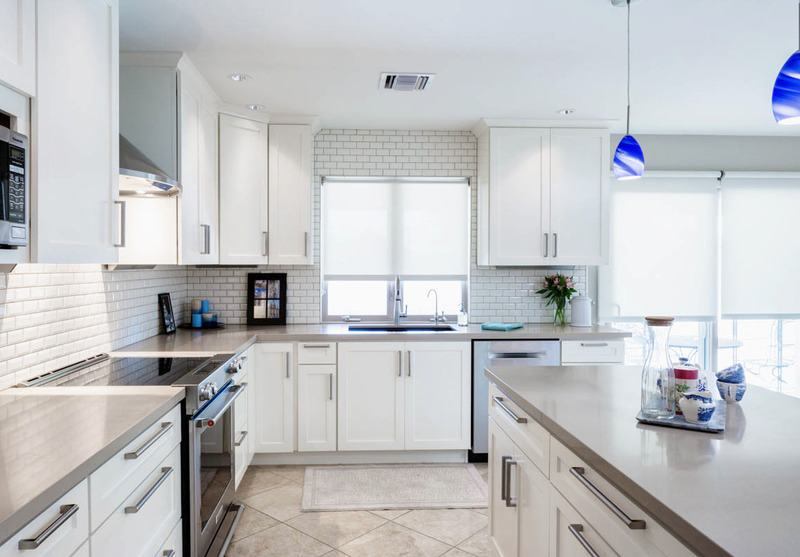 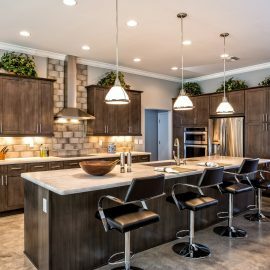 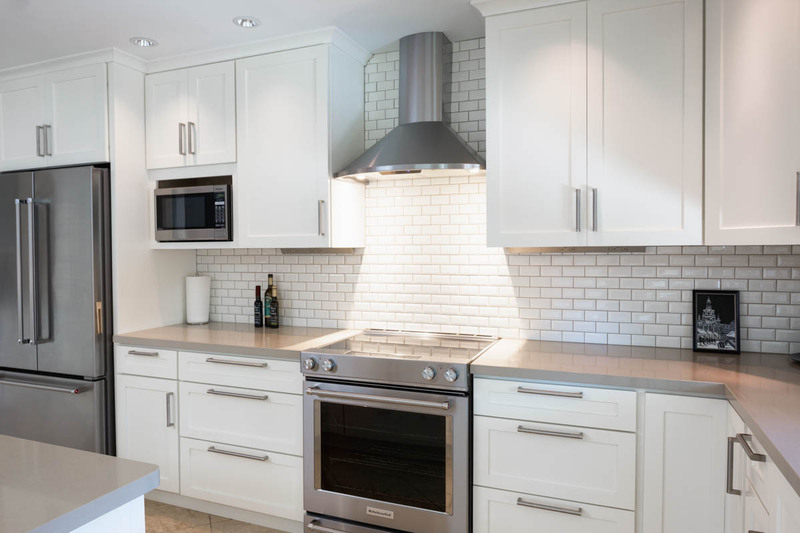 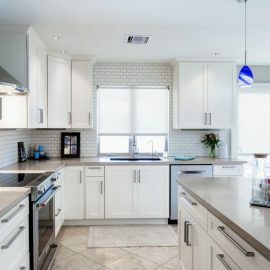 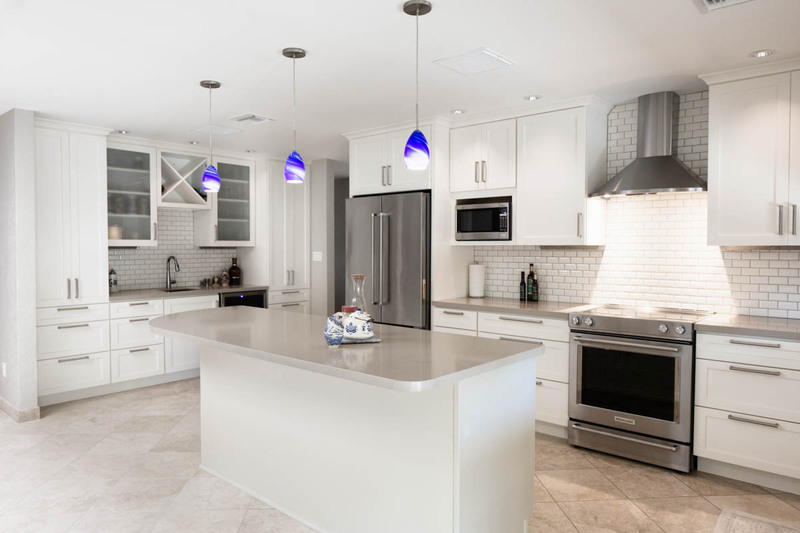 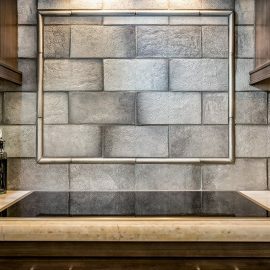 Lakeside Rebuild – In the kitchen we installed dark grey hand painted cabinetry and white granite countertops with a leather finish. 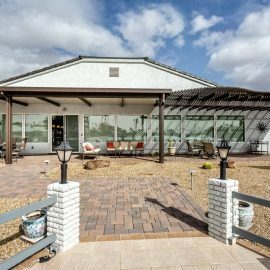 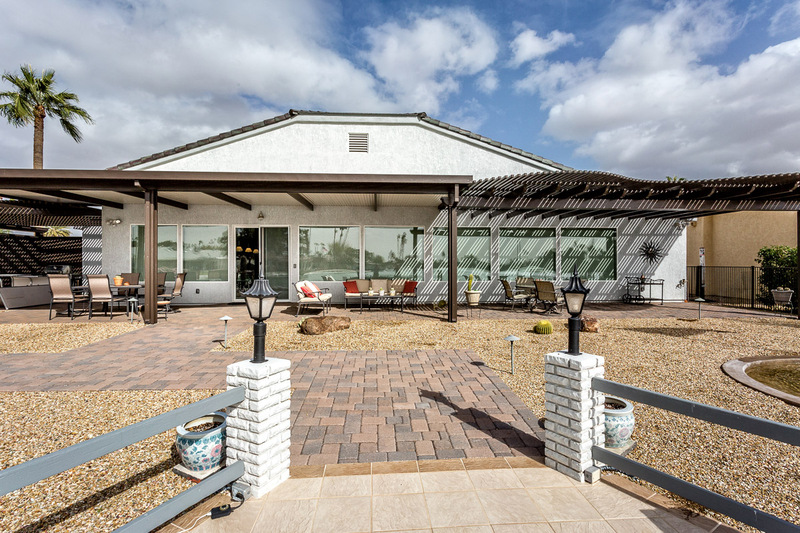 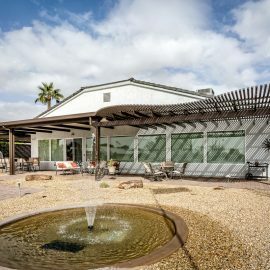 Lakeside Rebuild – My clients also like to entertain. 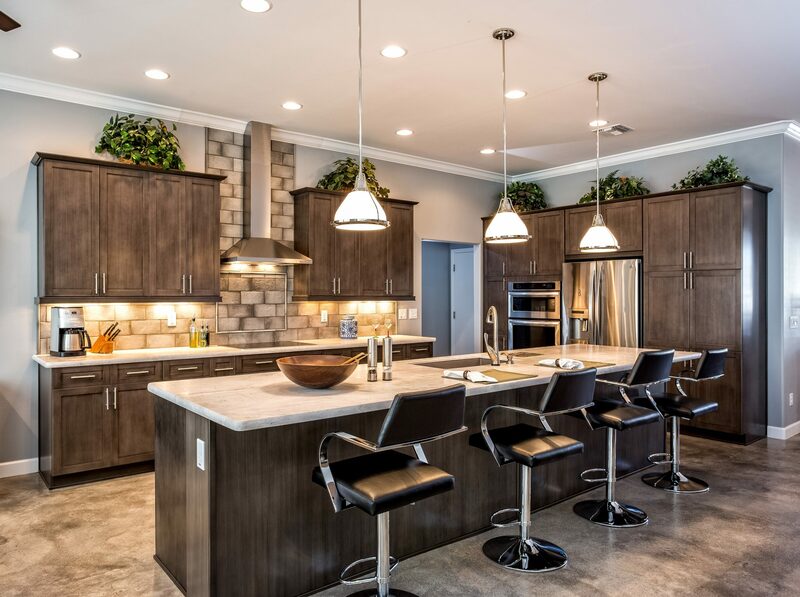 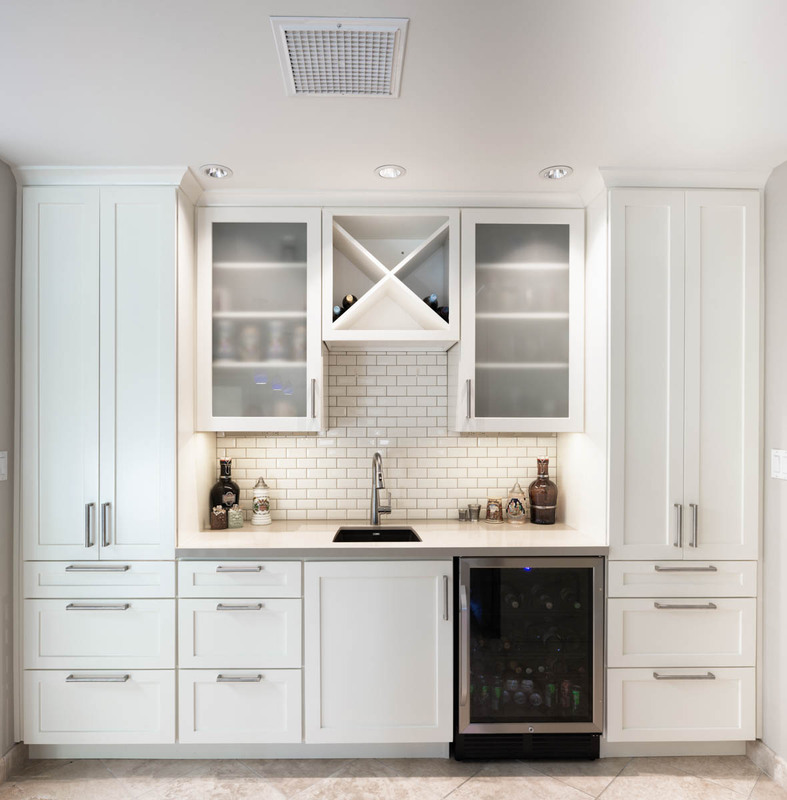 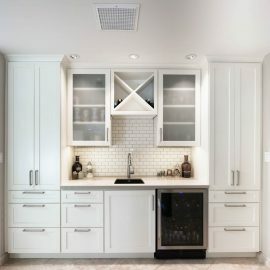 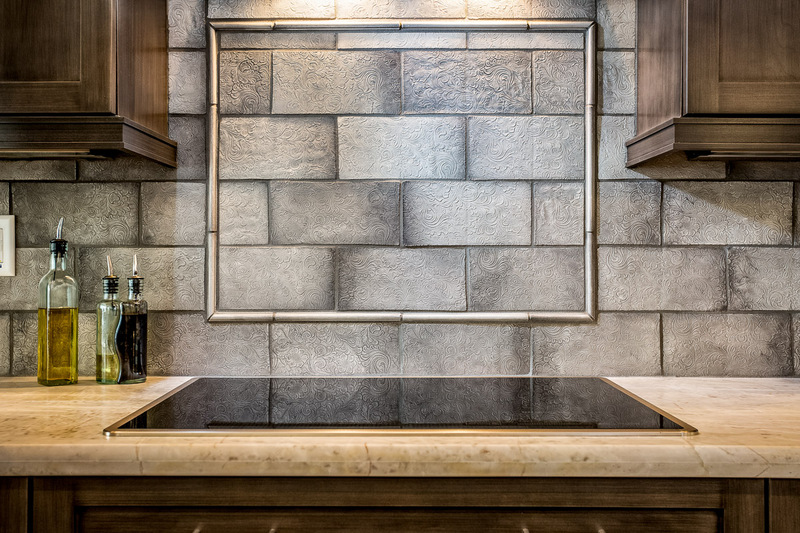 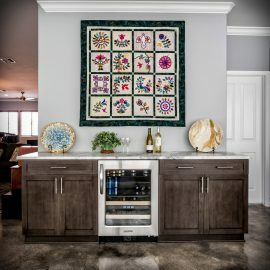 We created this bar area with a beverage fridge and space to set out appetizers and snacks when having friends over. 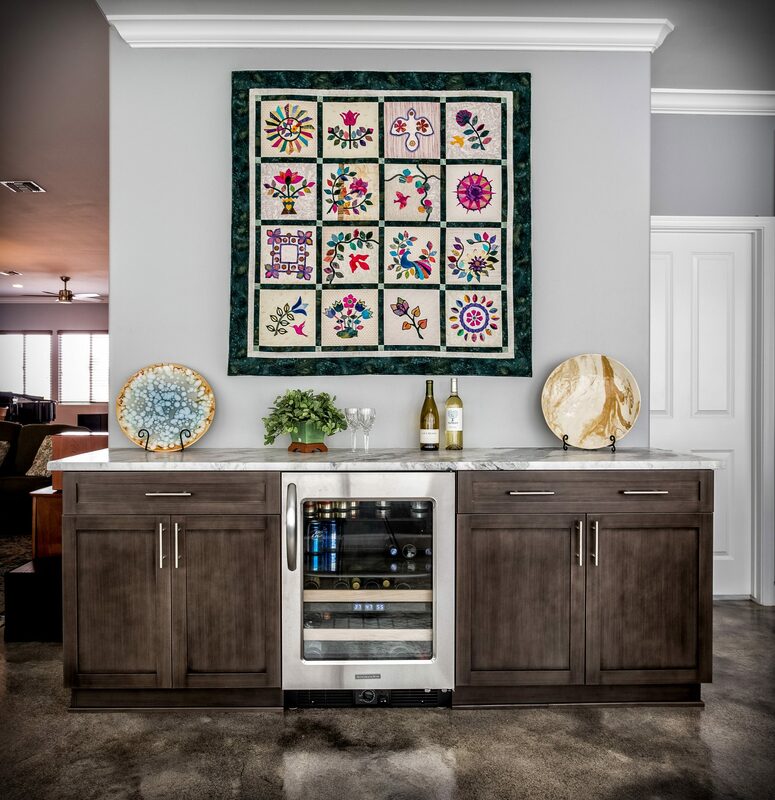 One of my clients quilts is hanging above the bar as art adding a pop of color to the home. 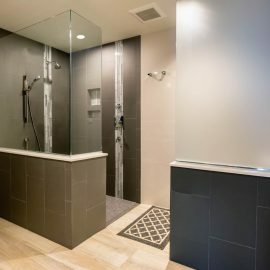 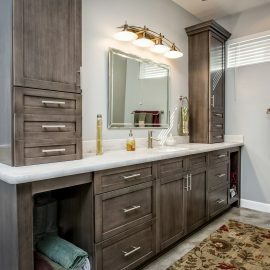 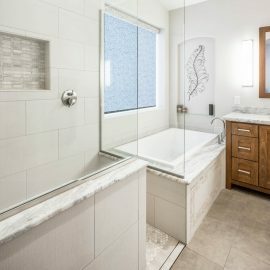 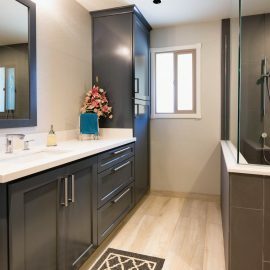 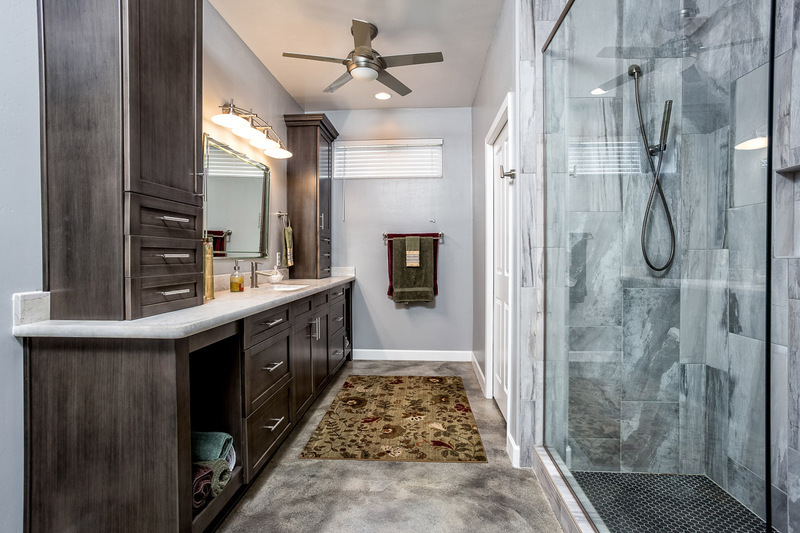 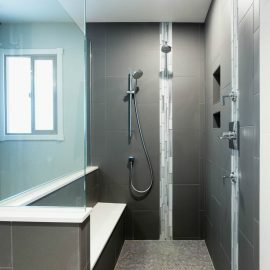 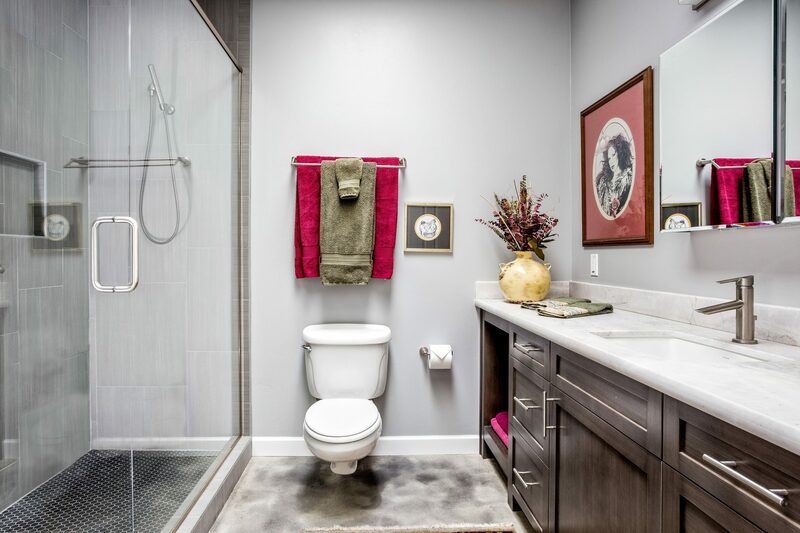 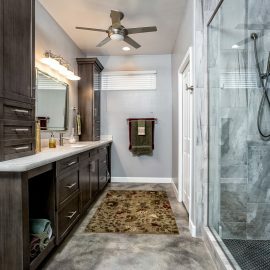 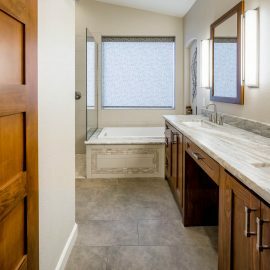 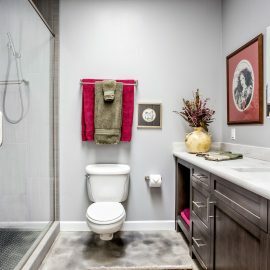 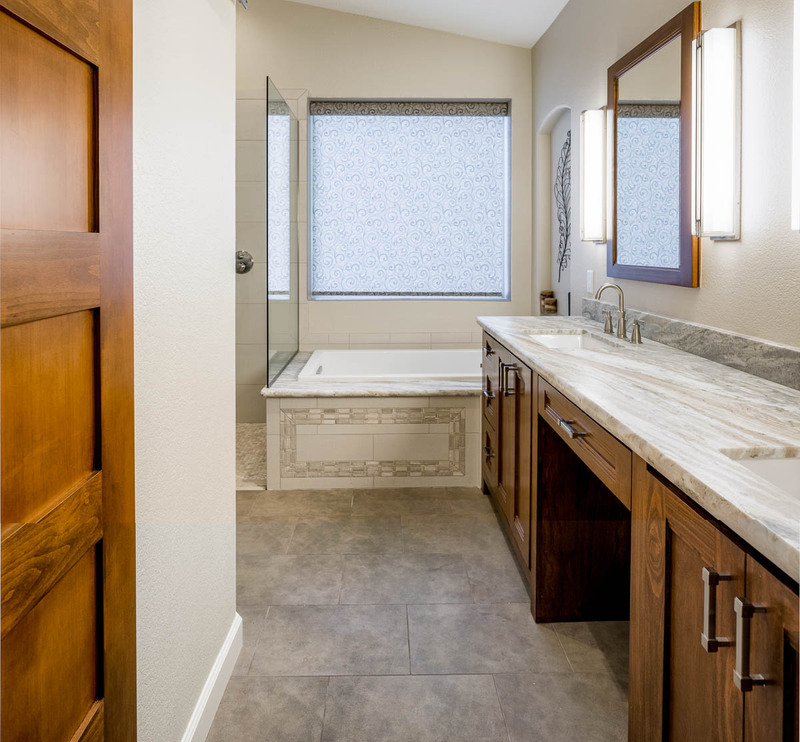 Master Bath Remodel – Studio Em Interiors – Lakeside Rebuild – The master bath has a large vanity space with plenty of storage for everything my clients need in the space. 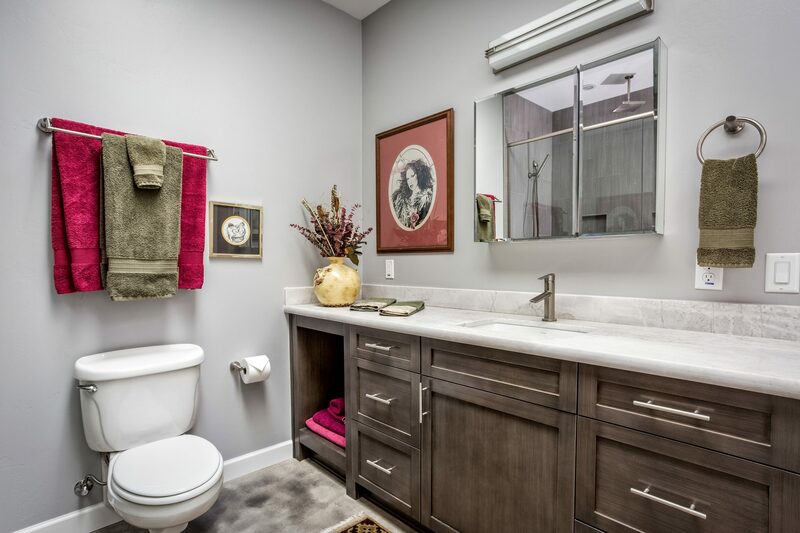 Again, we kept with the neutral greys and brushed nickel finishes. 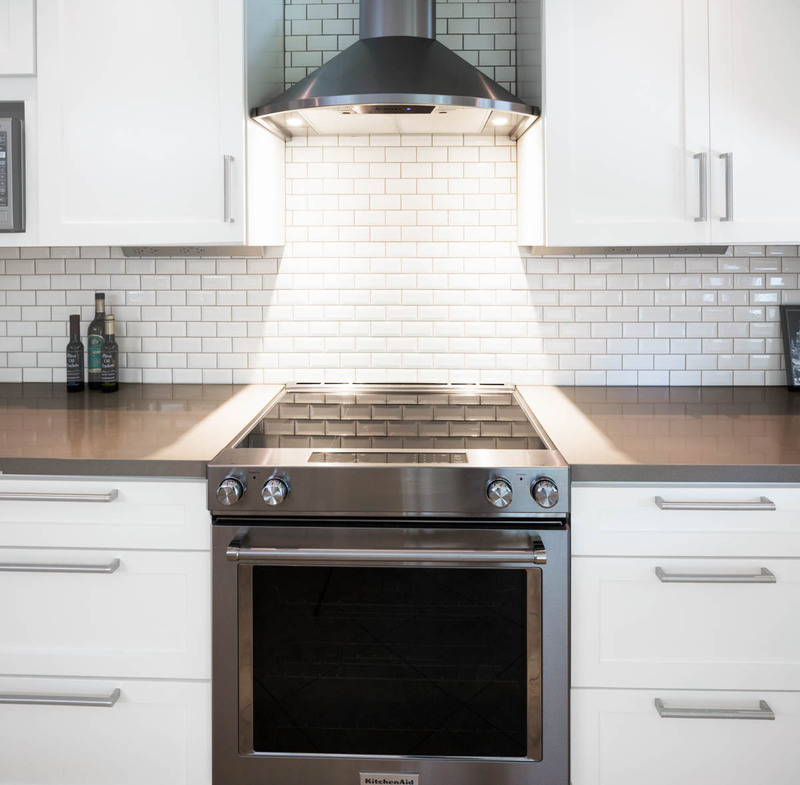 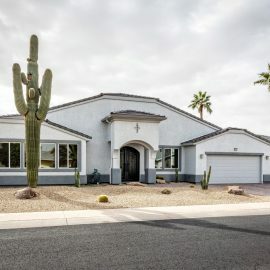 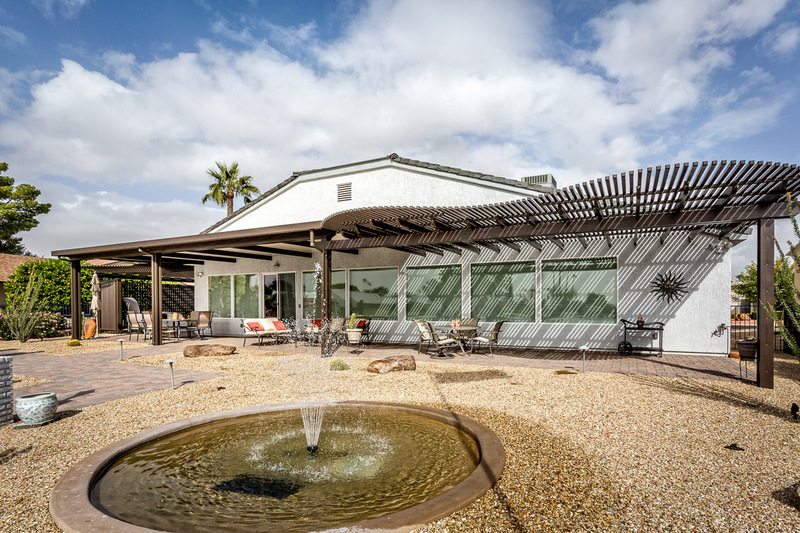 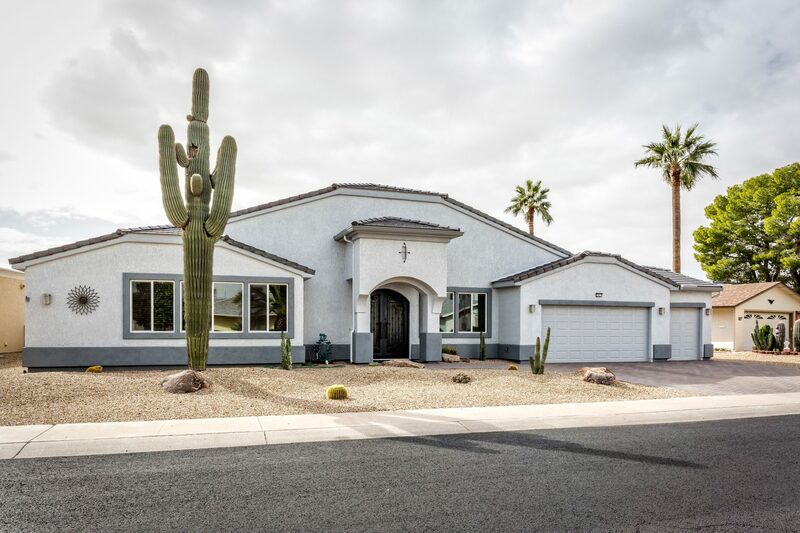 Lakeside Rebuild – Studio Em Interiors – We completely changed the front elevation of the home giving it a much better curb appeal and installed a gorgeous custom iron front door. 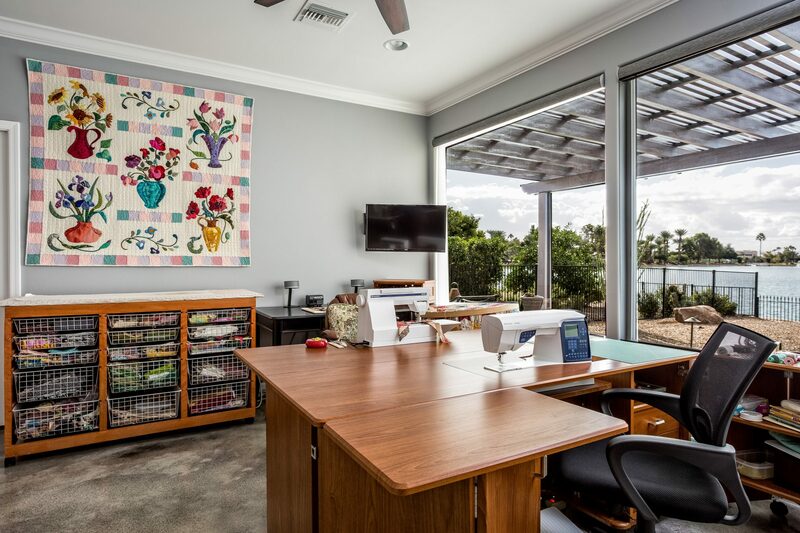 Lakeside Rebuild – Studio Em Interiors -The addition of different seating areas makes it perfect for entertaining before a boat ride. 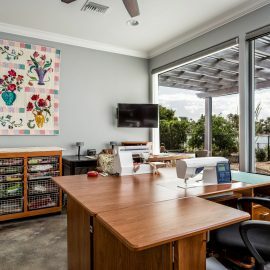 Lakeside Rebuild – Studio Em Interiors -The back of the home was made more appealing as well, giving it a much nicer view from those cruising by in their boats on the lake.